Former Fluin Lane Chapel as it is seen today. 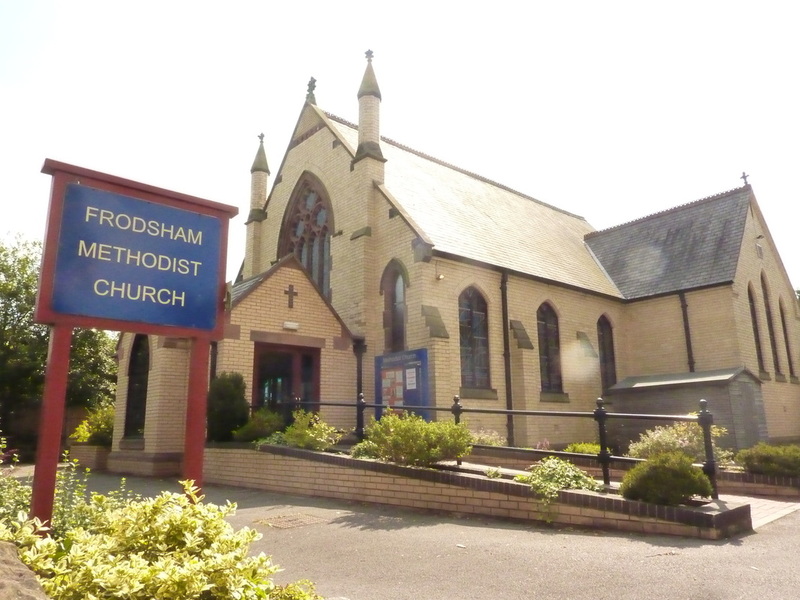 Methodists have been actively proclaiming the gospel message in Frodsham for more than 240 years. Our story begins with Joseph Janion of Bradley Orchard Farm. In 1765 Joseph’s sister, Phyllis Janion, married John Gardner at Frodsham Parish Church. John Gardner was a farmer at Tattenhall, but he was also a Methodist Local Preacher who preached the gospel throughout Cheshire and North Wales. Joseph Janion and his brother-in-law became close friends and Gardner lent Joseph Christian books and evangelical tracts. Joseph became a Christian and on 29th September 1772 he formally dedicated his life to God in writing, in the old Puritan tradition. Joseph Janion had no evangelical friends in Frodsham so in 1773 he joined the Methodist Society at Little Leigh. In the following year Joseph and his friend William Shone commenced a series of prayer meetings in Frodsham. The first Methodist open air preaching meeting was at the Market House in Frodsham in 1775, when John Hampson was pelted with vegetables by some in the crowd. However, some did respond to the preaching and soon after this a Methodist Class Meeting with 12 members was established at Overton. By 1790 the Methodists were meeting regularly in a barn in Church Street and within 10 years a new chapel was erected in what became known as Chapel Lane (now Fluin Lane). This chapel was used until 1873 when Trinity Wesleyan Methodist Chapel was opened. 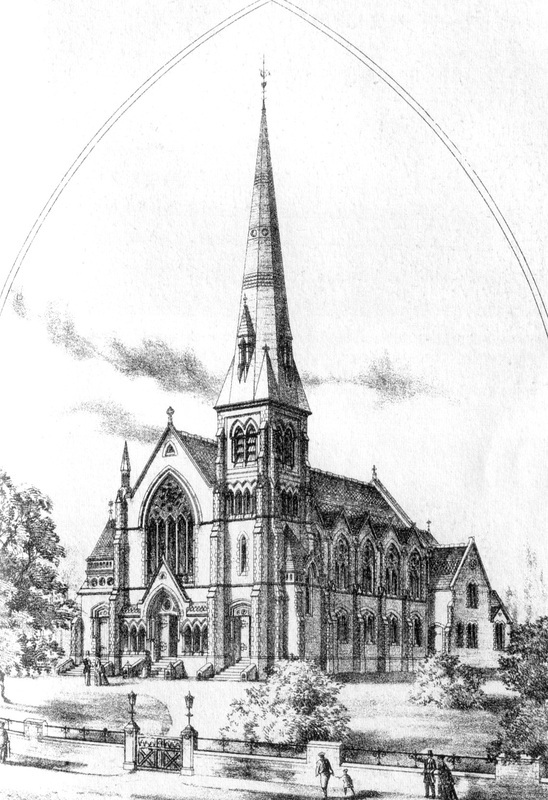 Trinity, built in the Gothic style and with a 123 feet high spire, became a familiar landmark in Frodsham. In the 1970’s dry rot was identified in the church building and during a two year period of alterations much of the old building was demolished. The Frodsham Society organised a “Save our Spire” campaign and with the help of the community the spire and some of the adjoining stonework was saved and restored. The remaining church building was reopened for worship in May 1979. Methodism was also active in the Five Crosses area of Frodsham. 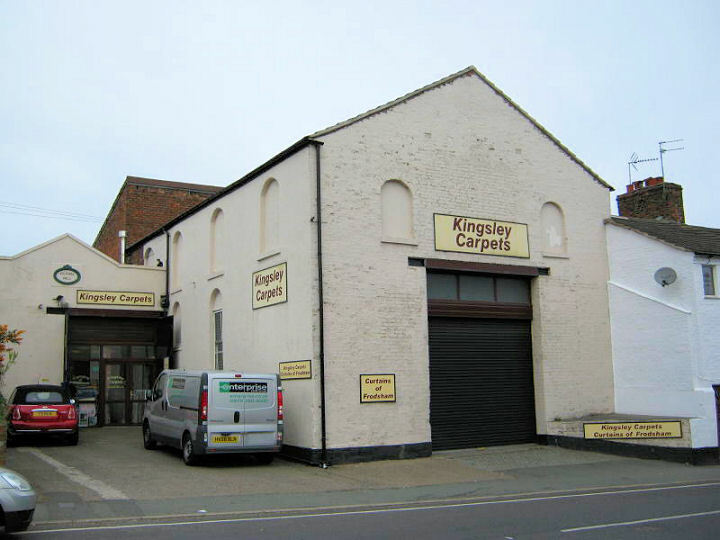 The members first met in local cottages, but by the late 1850’s they were in need of a permanent place of worship. Samuel Worrall, a farmer at Five Crosses, spent a night in prayer and before dawn he set out to walk to Runcorn to talk with Thomas Hazlehurst. Hazlehurst, whose family owned a Soap Works in Runcorn, was a devout Wesleyan Methodist and he donated large sums of money to build Chapels in Runcorn and district. Hazlehurst agreed to help the members at Five Crosses and in 1859 Eden Chapel was erected in Bradley Lane. Thomas Hazlehurst also provided money for the Trinity Wesleyan Chapel (1873). 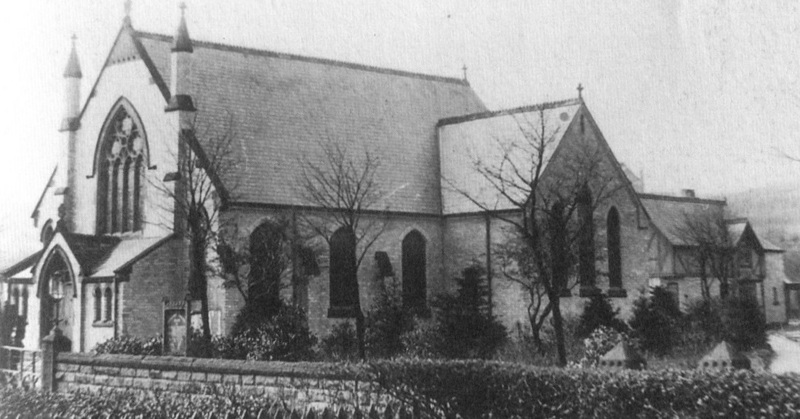 By 1885 the Five Crosses congregation had outgrown Eden Chapel and a new Chapel was built in Kingsley Road. The old building in Bradley Lane was used for Sunday School and other church activities until its closure in 1994. Trinity Methodist Chapel pictured soon after completion. Five Crosses Methodist Chapel photographed soon after completion. Methodism was originally a movement to bring renewal and revival to the Anglican Church. After the death of John Wesley in 1791 Methodism separated from the Established Church and divisions within Methodism soon appeared. The first split resulted in the formation of the Methodist New Connexion in 1796. It had little impact on this area. By 1801 the New Connexion had only 8 members in Frodsham. The Primitive Methodist Church had a greater influence on Frodsham Methodism. This denomination originated in the Cheshire/Staffordshire border area. Some Wesleyan Methodist evangelists, including Hugh Bourne and William Clowes, were employing new methods to bring the gospel to the people. Camp Meetings were held in large fields and lasted from dawn until dusk. Hundreds were drawn to these lively evangelistic meetings and the converts were encouraged to join local Wesleyan Methodist churches. Unfortunately, the leaders of Wesleyan Methodism were not happy with the methods being used and they expelled Bourne, Clowes and their associates from the church. The expelled preachers called themselves “primitive” (original) Methodists because they believed that they were merely following the example of John Wesley with their open air preaching. The new Primitive Methodist Church grew rapidly. Preston Brook became the centre of a large Primitive Methodist Circuit. The Primitives held Camp Meetings at Five Crosses and Overton and regular services were held at a cottage in Main Street. They eventually erected a church at Frodsham Bridge. This building was later used by the Church of England as the Bridge Mission. The Primitive Methodists then moved to the other end of Frodsham where they built Bourne Primitive Methodist Church in 1876-77. Bourne Church closed in 1987. In the 1830’s there was considerable debate in Methodism on the subject of a new theological college. Dr. Samuel Warren, who campaigned against the college, was expelled from the Methodist church in 1835. He founded the Wesleyan Methodist Association which attracted many disaffected Methodists who were opposed to the autocratic attitudes of the Wesleyan Methodist Conference. Samuel Warren visited Northwich in 1835 and addressed a meeting at the Congregational Chapel. Many Local Preachers from the Northwich Wesleyan Circuit attended this meeting, and the Frodsham preachers presented Dr. Warren with a Cheshire cheese. When Rev. Samuel Sugden, the Wesleyan Superintendent Minister, heard about this he immediately expelled the Frodsham preachers from the Wesleyan church. As a result of Sugden’s actions a large number of Methodists left the church and joined the new Wesleyan Methodist Association. During his ministry in the Northwich Circuit 900 members left the church. Bourne Methodist Chapel as it is seen today. The first Wesleyan Methodist Association chapel in this area was built on the Rock, High Street, Frodsham in 1837. It was known as the Tabernacle. The Wesleyan Methodist Association later joined with other groups to form the United Methodist Free Church. The Tabernacle was a place of worship until its closure in 1937. 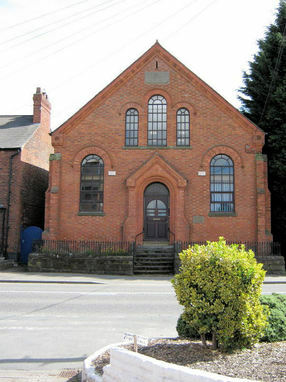 The building is now in use as Frodsham Library. Another local Wesleyan Methodist Association chapel was erected at Blake Lees, Kingsley in 1843 and is still a thriving Methodist church. After the closure of Bourne Methodist Church in 1987 worship continued at Trinity and Five Crosses. 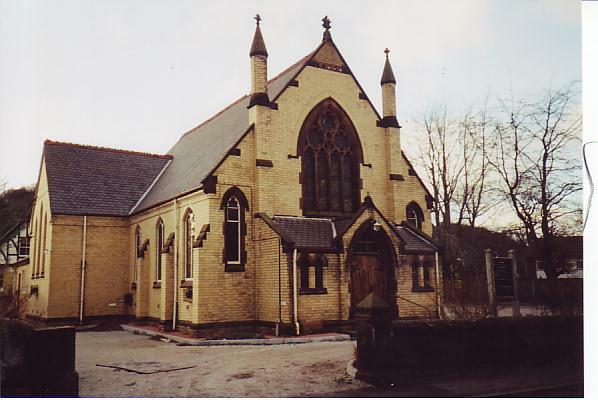 In 1990 the Church Councils of Trinity and Five Crosses merged to form a united Frodsham Methodist Church with shared worship in the two buildings. In April 2000 Trinity Church closed and worship and outreach are now based at the Five Crosses site which is now known as Frodsham Methodist Church, Kingsley Road, Frodsham. Frodsham Methodist Church, Kingsley Road, as seen today. I think our first Church banners, at least those still in use, started at a Church holiday at Kents Bank in Cumbria in 1990, when many members of the youth group were joined by church members from two of the then Frodsham churches (Five Crosses and Trinity), for a time of fun and fellowship. We started two banners - one for each church. These early banners were made using Copydex to glue the shapes of fabric onto the backgrounds, and in later years the glue came through as ugly dark marks on the fronts, and so unfortunately they had to be destroyed. ​​The next ones were begun on a church holiday in Llanferfechan, and this time we used Bondaweb to apply the pieces onto the background. Members first drew round their hands or feet onto the Bondaweb and cut them out onto their chosen fabric, and then we ironed the hands or feet onto the backgrounds. ​Five Crosses folk used hands (left), and Trinity ladies used feet. On our return from the holiday we were able to sew the appliqued pieces on at our leisure. The designs we did at that time were worked as a group of us interpreting themes. 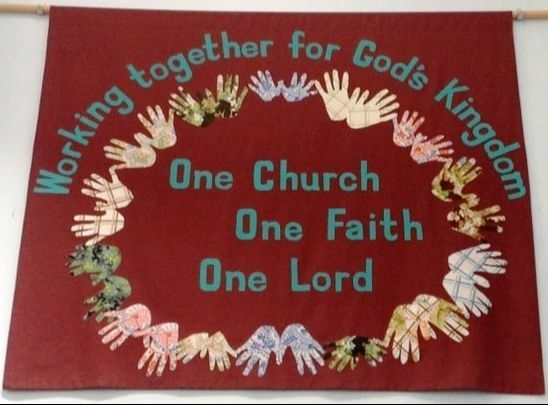 But in later years there were less of us to make the banners, and we chose the topics to go with the Church seasons and got together when we could at Church. ​​We never had any money for fabrics and so we asked people to donate unwanted fabric - which was great but we did have limited choices to work with. The doves in our Pentecost banners (at the bottom of the page) were left-overs of people's wedding dresses. ​Strangely, crimplene was actually very good for the backgrounds as it did not need ironing! The Harvest banner for Five Crosses had motifs cut from curtain fabric. The bread was painted onto fabric by Mrs. Hilary Picket, a member of the Church. Originally I had to sew on freshly harvested wheat every year (because we couldn’t roll it up with real wheat!) and remove it before storage. I finally decided to embroider wheat to make life easier. After use, the banners are carefully stored on cardboard rolls and need to be ironed before they are hung up again. ​The advent banner (right): John Langley, a Local Preacher, asked us to make the candle banner for Advent, using his copy of a Christmas card as a design. I did most of the lettering on the Five Crosses banners, but as I am not very confident, I used very simple letters traced from cardboard templates - the Trinity ladies were far more adventurous with their lettering! 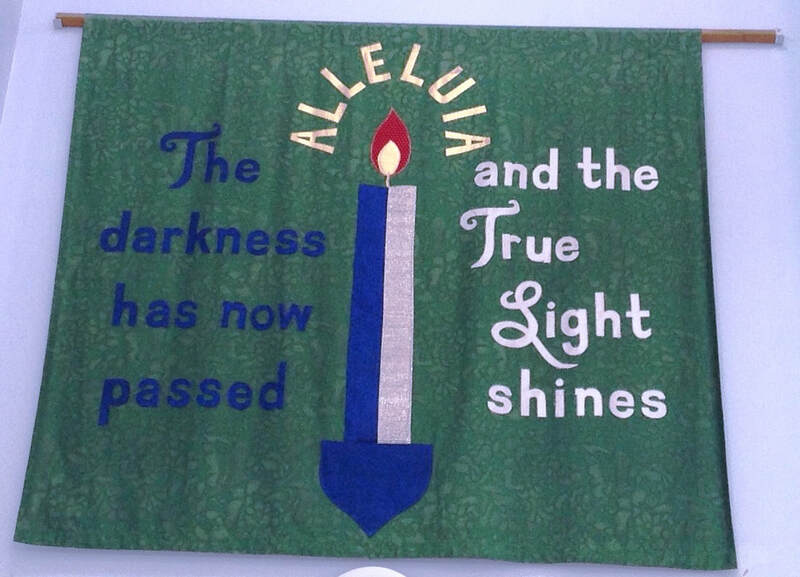 ​The Millennium banner (below right): we produced the 2000 banner when the two churches joined together. We managed to get the curtain samples from one of the local shops and they were used as the background. I bought the fancy gold of the cross as a skirt in a charity shop, and I think this was the first time that we had money from the church to buy the wadding and backing fabric. ​This banner was quilted, whereas all the others are just two layers. Won by One (below) - is actually my banner, on loan to the Church. My old church, Eden Grove Methodist Church in Bristol, had made one and I liked it so much that I asked them about it and they gave me a copy of a small poster from which they took their inspiration. I took this to be copied and printed in a larger size. Then I traced the design onto tracing paper, leaving out unnecessary blobs in the background. I worked it by first using a layer of black fabric, followed by a layer of white felt, and finally the tracing - all tacked together. I then used my sewing machine to sew round all the markings. Then the tracing paper was torn away, and I had to carefully cut all the background felt away - leaving the finished design. ​But, as the image was revealed, I was horrified to realise that I could not see the face of Christ! I stomped out of the room, flinging the banner onto the settee, upset that all my work had failed. Yet - on my return to the room, I saw Christ reflected in the glass cupboard doors opposite … I had been too close to see it at first. What a relief! I have to say this is probably my favourite". ​Note: The banners are regularly admired when we have visitors in the Church, and the Church are grateful to those who made them and to Camille who has since shared her talents in the maintenance of our sets of banners, and in writing about them. ​During the Millennium celebrations, two of the banners were on display at Castle Park Arts Centre.